We’ve had an early taste of late autumn… or dare I say winter this past week. Temps in the 30’s! It’s ok to wear fleece with flip-flops, right? Coastal Virginia doesn’t usually even get cool until Thanksgiving! 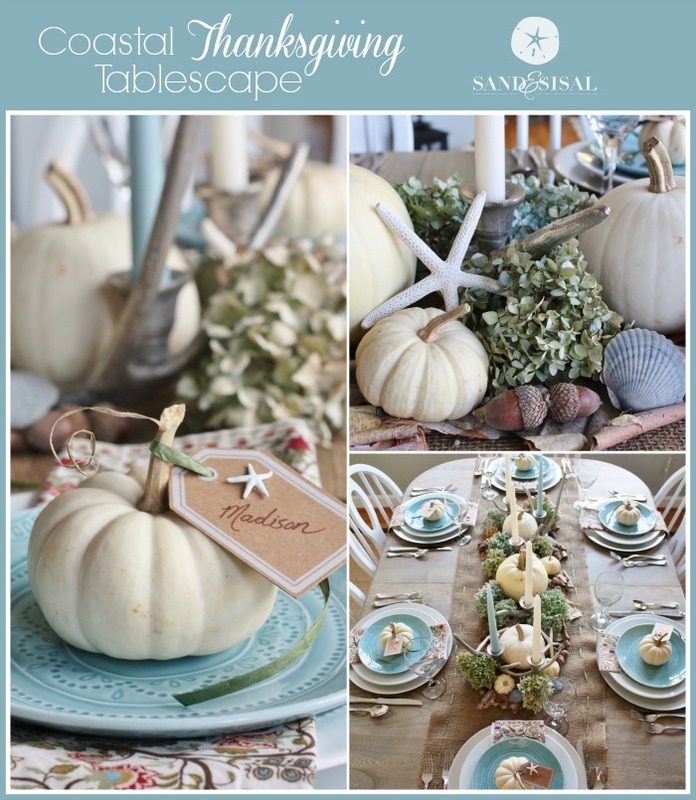 Cold temps or not, I’m excited to share with you my Coastal Thanksgiving Table! 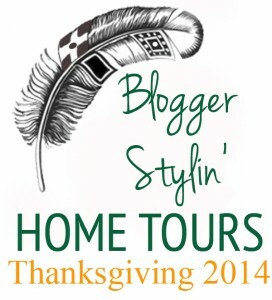 This week I’m participating in Blogger Stylin’ Home Tours hosted by The White Buffalo Styling Co. Twenty five fabulous friends are sharing their Thanksgiving tables this week and you can hop from one blog to the next to see them all. Be sure to hop over to the blog before me today The DIY Playbook and then the blog after mine, This, That & Life. The 1st Thanksgiving in 1621 at Plymouth, MA was a Coastal Thanksgiving… did you know that? The 1st Thanksgiving menu consisted of 5 deer given to the Pilgrims as a gift from the Native Americans, local veggies like onions, beans, cabbage, beans, lettuce, corn porridge and seafood like lobsters, clams, oysters, scallops and muscles which were plentiful along the shoreline. 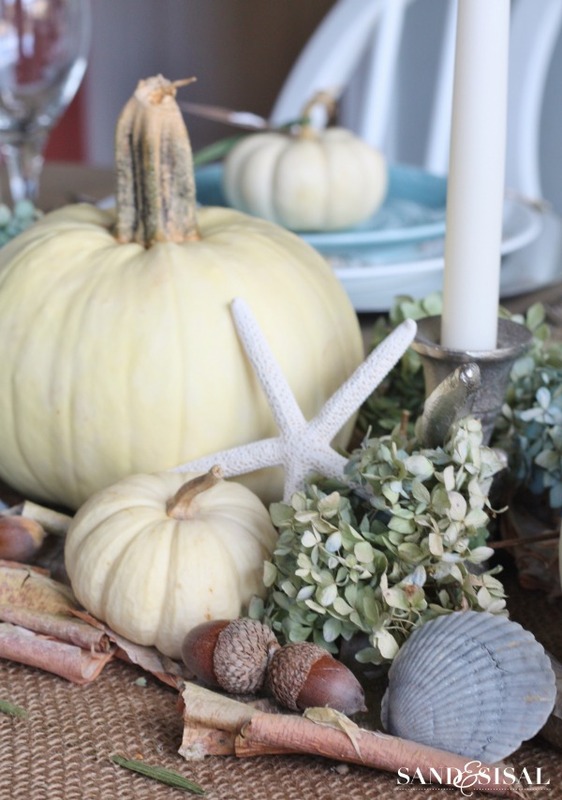 This year I’ve given my Thanksgiving table a coastal nod and incorporated watery blue candles and plates and added a few starfish, clam and scallop shells to my White Pumpkin Centerpiece which I shared earlier this fall. 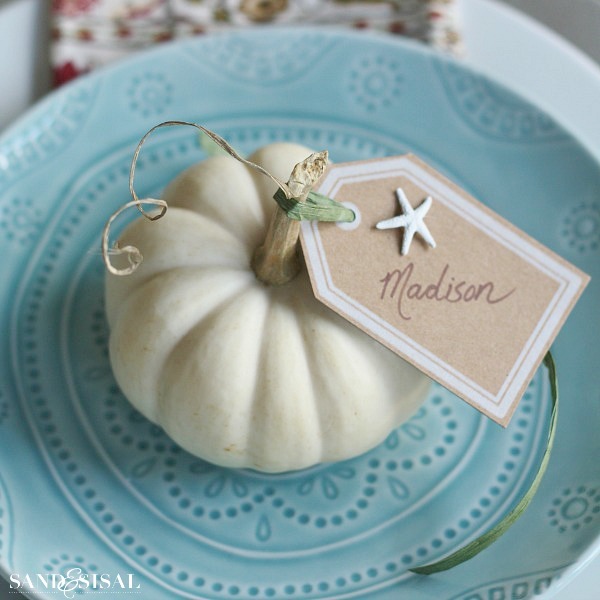 Small baby boo white pumpkins with name tags tied with green raffia make pretty little place cards. A small starfish is hot glued to each tag also. These place cards are extra special though. On the reverse side of each name tag I have written a little message expressing why I am so thankful for that person. In past years I’ve made Thanksgiving Thankful Favor Boxes filled with treats and a special written blessing for each person. It is a simple gesture to share a bit of love, thankfulness and encouragement with your loved ones, friends, and guests. We truly have so much to be thankful for don’t we? We live in such a blessed nation and I know that I personally have a tendency to take it for granted. I get caught up in the hustle and bustle of life, the materialism, the holiday decorating and shopping, and the whirlwind of daily schedules and responsibilities. Thanksgiving is a wonderful time to put it all aside, do a personal inventory of our hearts and priorities, and thank God for all that we have and refocus our mindset going forth into the Christmas season. 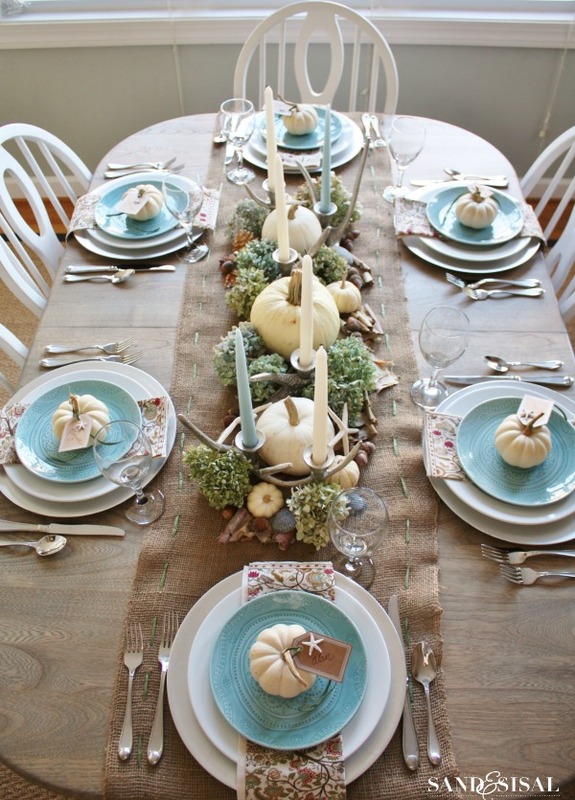 This Coastal Thanksgiving Table’s soft and serene color scheme of greens, creams, browns and blues is certainly non-traditional but is a collective gathering of all natural elements. The table runner is made of burlap and raffia. The white pumpkins are from a local farm. The dried green and blue hydrangeas came straight from the garden, the birch bark and acorns are from the trees out front and the seashells were collected this summer at the beach. I did purchase the beautiful silver antler candelabras from TJMaxx/Homegoods. I’m sure they’ll come in handy for Christmas decorating too! I think this is my favorite Thanksgiving tablescape ever! I hope you love it as much as I do! From my family to yours, may you all have a very blessed Thanksgiving season! Really pretty! And your green walls look great as a backdrop. I have a crazy question. How do you serve Thanksgiving dinner with all the centerpiece covering the table? Do you serve buffet style? We have a table full of food so I centerpiece like this wouldn’t work. Just curious since I see so many bloggers doing such elaborate pieces. Thanks. I love the centerpiece so much! And I adore that subtle mix of candle colors! Thank you Lindsay! And thank you for hosting a blog hop full of so much gorgeous holiday inspiration! Everyone’s tablescapes are so unique . There’s a tablescape to fit anyone’s style and decorating budget. There’s a turquoise theme going in today’s tours, and I love it! Your table is beautiful, Kim. Love your napkins and touches of the coast! Haha! I noticed that too Jennifer! (great minds think alike 😉 Thank you so much! Where did the napkins come from? I bought the napkins at Pier One last year 2014. Thanks! Who knew starfish and pumpkins could work so well together?! I would have never thought they could, but you nailed it! it’s gorgeous!!! 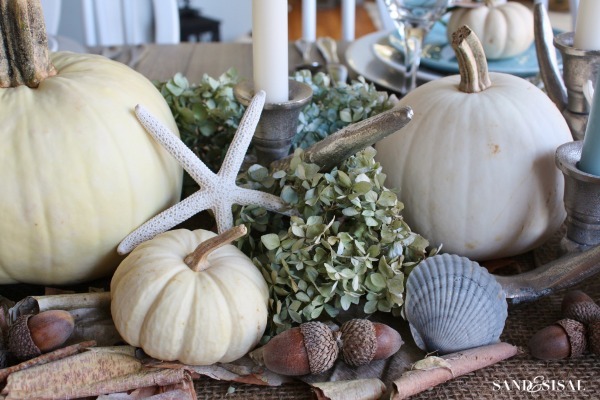 seastars and pumpkins- who knew they could be such a beautiful pairing! i love it, kim! Your centerpiece is the absolute best I’ve seen. What a wonderful mix of items. The touches of blue really draw me in, and the photos are fabulous. Very, very creative!! The best you’ve seen? Oh wow! I’m honored! Thank you so much Deb! You just made my day! Once again, you inspire me: it’s simple, yet full of ideas! 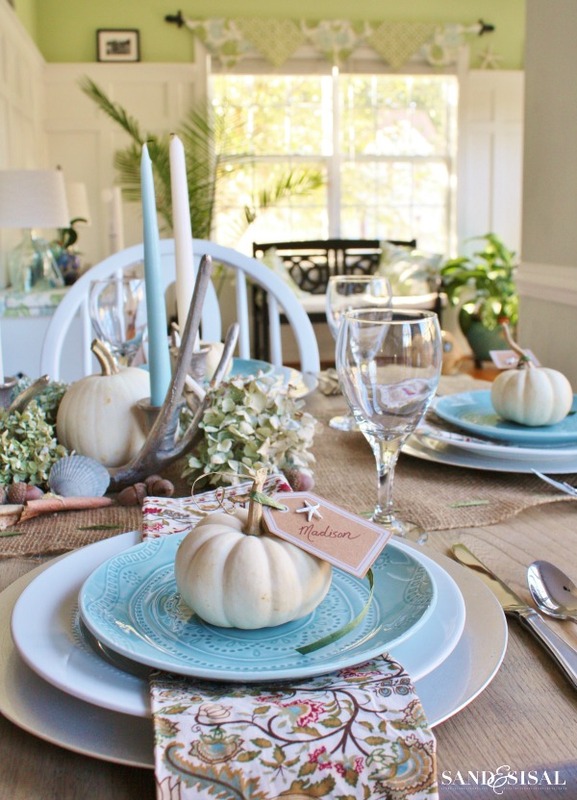 Love love love the coastal Thanksgiving table setting! I am currently decorating my little lake house in a coastal kind of style with these same colors. So peaceful and restful! I followed his from Pinterest – beautiful ! Just an issue I noticed on iPhone with your site- I had to scroll through 5 or 6 pages of ads before I got to the post. Just in case you were not aware. Thank you Lesley! Strange about the ads, sorry about that, thanks for letting me know. Every detail is so pretty Kim – I love it! What a beautiful, beautiful table setting! 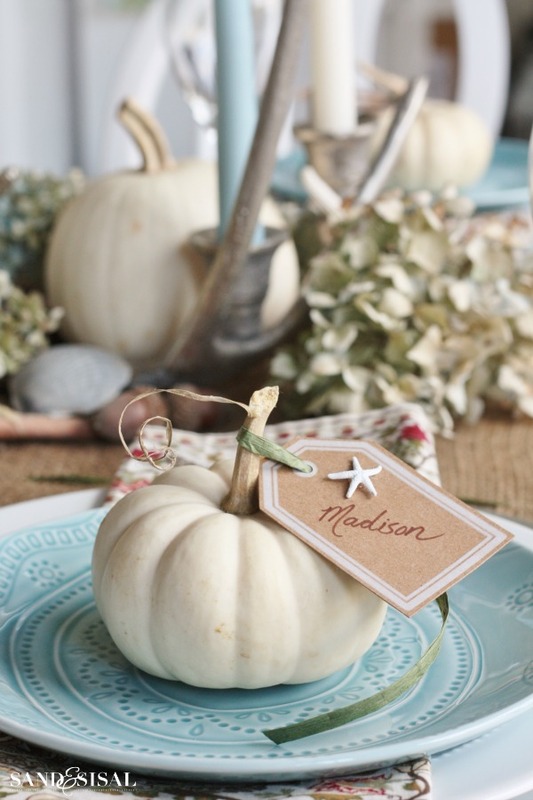 Loving the coastal vibe and the baby boo pumpkin place holders. I found you at Uncommon Slice of Suburbia and am a new follower. Have a lovely week! Thank you so much Deborah! I really appreciate that! Oh my gosh I LOVE the colors!!!!! I love the dinner ware I would love to know where to get it? 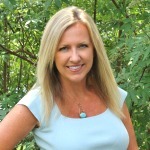 Thanks Lesa! It’s from Target. This is a really lovely table setting. I’m a kiwi married to a Texan and we celebrate thanksgiving in New Zealand so there’s plenty of decorative styles that I can’t really do, pumpkins, gourds etc are out of season here, but this I think would work for us! Really pretty. Hope you do a similar post for Christmas! Where are the watery blue dishes from? LOVE the plates! Where did you find them? Love it. Where in the world did you get the tiny starfishes and the name tags? Thanks Erin! They came in a little packet from Michael’s Craft stores.